Transportadora Callao S.A., the logistics operator of a special cargo terminal in the port of Callao/Peru, relies on a BEUMER Group pipe conveyor for the transportation of zinc, copper and lead concentrates of different mining companies from the warehouse to the terminal. With its ability to navigate curves in three dimensions, the conveyor can be optimally adapted to its routing course of approximately 3,000 metres. Of even greater importance: the conveying system prevents the concentrates from coming into contact with the environment and ensures dust-free transport to the ship’s holds. BEUMER Group was responsible for engineering and supply, including the steel structure, supervision of the installation and putting the pipe conveyor into operation. Callao is located directly on the Pacific Ocean. With 877,000 inhabitants, it is one of the largest cities in Peru, with the largest airport in the country and one of the most important fishing and commercial ports in South America. A modern shiploading terminal for ore concentrates was built in this port and it is operated by Transportadora Callao S.A.
About 75% of the imports and exports of Peru, one of the most important mining countries worldwide, are handled in Callao. In order to satisfy the increasing demand for these valuable materials, the Peruvian government decided to expand the port. Besides additional storehouses, the plans also foresaw the largest, most modern shiploading terminal in the country. Peru also wanted to change the way the raw materials were transported to the shiploading areas. Before the construction of the special terminal, trucks were used to transport the concentrates from the warehouses to the port terminal. “Since Transportadora Callao started its operation, they could reduce the truck drives by 130,000 per year,” explains Victor Sam, CEO at Transportadora Callao S.A. The company, a consortium comprising five enterprises from the mining and port industries (manufacturers and warehouse logistics operators), obtained a licence from the state of Peru for building and operating the necessary infrastructure. BEUMER Group supplied and installed a pipe conveyor with a centre distance of 3,195 metres. “Due to the system design and the required system capacity, we designed it with a diameter of 400 millimetres,” explains Wolf. “The conveyor transports 2,300tph [tonnes per hour], at a speed of 4.5m/s and is driven by three motors with a capacity of 650kW each. We equipped the system with filters, strippers, a dedusting unit and a control system.” BEUMER Group was responsible for engineering and automation, and supplied the steel structure and the necessary components. The site managers supervised the installation and put the system into operation. The process is practically free of faults and, above all, safe: trucks or trains transport the mining commodities from the mines to the ore storages, from where they are transported to the open access station. Here, the concentrates are received by a feeding 43m belt conveyor that transfers it to the pipe conveyor at a height of six metres. A dedusting unit ensures that no material is emitted during this process.“We equipped the feeding belt conveyor with a metal detector and an electric magnet,” explains Wolf. 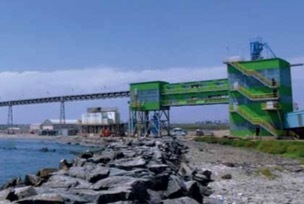 “This prevents damage of the downstream pipe conveyor by metal parts.” At the end of the route, the conveying system runs along the seaside in the naval port of Callao to the transfer tower. Here, the belt opens automatically. It transfers the material to another belt conveyor that conveys the ore to the shiploading system. “A big challenge for us was integrating the pipe conveyor into the existing environment,” says Wolf. The BEUMER system is the connection between the individual belt conveyors from various manufacturers. “When managing the project we had to meet several official requirements,” reports Wolf. The project represents a concession by the state of Peru given to Transportadora Callao S.A., who commissioned Odebrecht Peru´ Ingenieri´a y Construccio´n with the execution, and Buenaventura Ingenieros S.A. with the supervision. Odebrecht commissioned BEUMER Group with the design of the entire line section onshore. The onshore section starts at the ‘Open Access’, where the concentrate is transferred from the warehouses. The pipe conveyor then passes a refinery and a military area. “That was the specified routing that we had to observe,” explains Wolf. In the area of the refinery, the systems had to additionally be equipped with fire-proof covers. Due to this impressive engineering work,Transportadora Callao is now able to handle ships for bulk products of up to 60,000dwt without obstructing the work in the other terminals of the Callao port. BEUMER Group has bundled its comprehensive expertise spanning various industries and established different Centers of Competence in order to offer optimal support of their single- source solutions for companies like Odebrecht and Transportadora Callao. The pipe conveyor segment is one such Center of Competence. This centre is responsible for sales and project management worldwide. It collects and prepares the know-how of each regional group company and passes it on to the group company’s global experts, such as Wolf and his team. “BEUMER’s technical team has proven its professionalism and stand-by duty, during construction and operation, and after 1.5 years in operation and more than four million tonnes of transported concentrates, we can attest that the set goals have been reached,” explains Sam. BEUMER Group’s extensive Customer Support ensures a high level of system availability after commissioning. Transportadora Callao just signed a teleservice contract with BEUMER Group, so that BEUMER specialists can eliminate possible malfunctions in the system. If necessary, the BEUMER Group service staff will go to Callao in order to make the necessary adjustments and prevent malfunctions and machine breakdowns, which would lead to long downtimes.